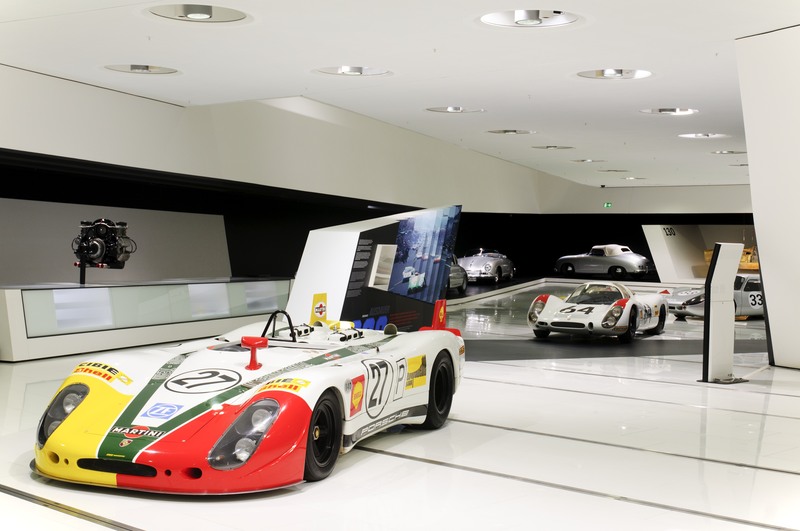 From March 26 to July 13, 2014, the Porsche Museum presents a comprehensive special exhibition about Le Mans. Stuttgart. 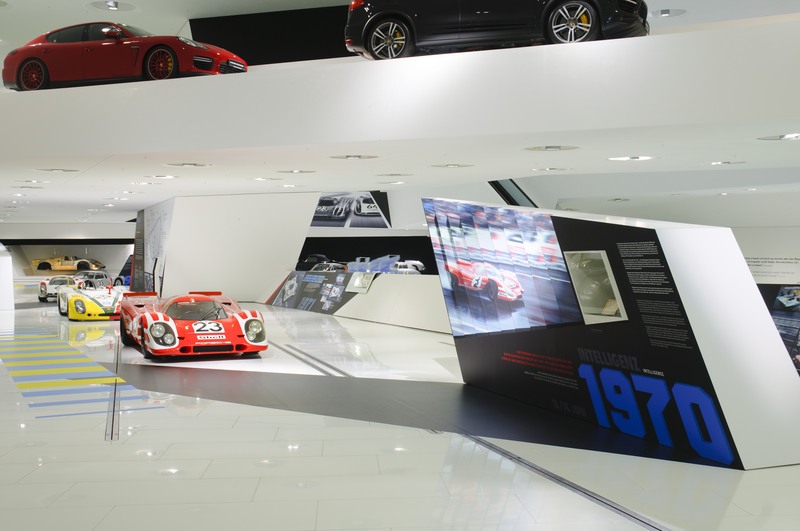 The Porsche Museum in Stuttgart-Zuffenhausen is getting attuned to the return of the sports car maker to Le Mans: with a comprehensive special exhibition from March 26 to July 13, 2014, Porsche is taking a look back not only to its multiple previous successes at the French endurance race. The present-day Le Mans commitment is also being placed on centre stage: for the first time, the Porsche 919 Hybrid will be presented to the greater public at the Porsche Museum. The car celebrated its premiere only three weeks ago at the Geneva Motor Show. 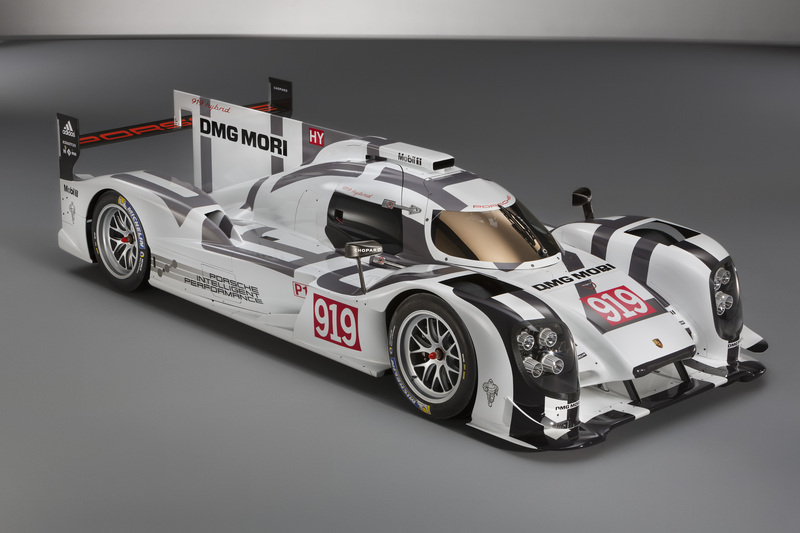 Until May 4th, 2014, the 919 Hybrid mock-up will be on display at the Porsche Museum. 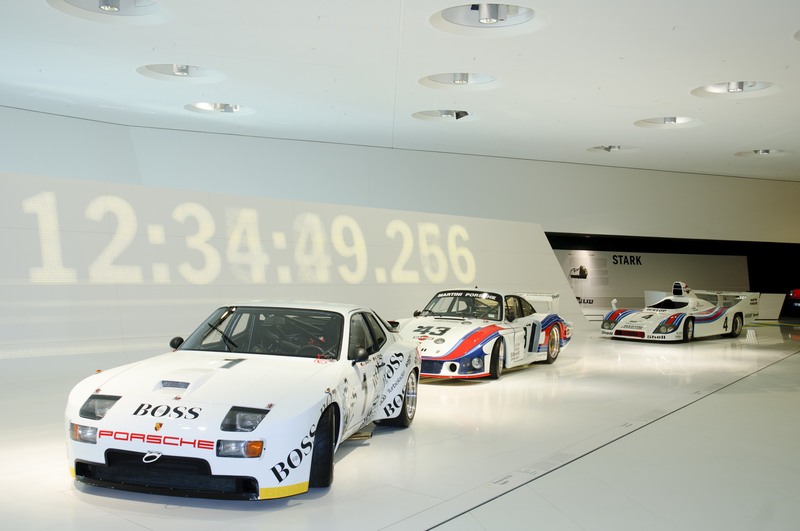 The exhibition at the Porsche Museum is transformed to a racing track in homage to the famous endurance race. The focus will be on the 919 Hybrid, the fastest research lab and most complex racing car Porsche has ever built. 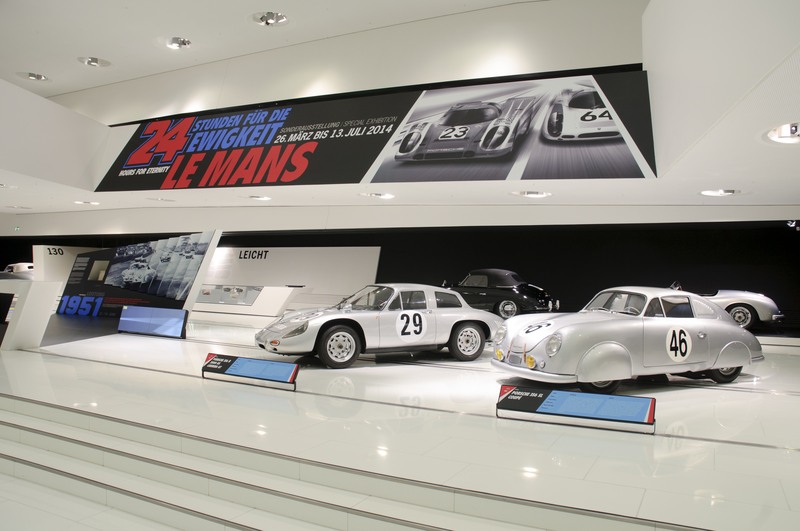 The onset of the Porsche Le Mans history in 1951 marks the beginning of the “24 Hours for Eternity” special exhibition. For the first time on display: The Porsche 908/02 Spyder LH with the nickname „shark fines“ achieves the 3rd place in the overall classification. Re-enactments of racing situations from the victorious racing years on life-sized prism walls and track sections such as the Hunaudières straight will guide the museum visitor through the special exhibition. New: Re-enactments of racing situations from the victorious racing years of Porsche will be presented on life-sized prism walls. More than 20 different racing cars tell the unique and exciting history of this legendary 24-hour race. Alongside the 919 Hybrid, you can see at the Porsche Museum for the first time the 1969 Porsche 908/2 Spyder long tail, the 1971 Porsche 911 T/R, the 1974 Porsche 911 3.0 RSR as well as the 1981 Porsche 936/81 Spyder and many more. The Porsche 936, which already captured the races in 1976 and 1977, is reactivated in 1981 for the 24-hour race. With 360 km/h, the 936 is the fastest vehicle in the field on the Mulsanne straight and brings its drivers Jacky Ickx and Derek Bell the sixth overall victory – with a lead of 14 laps. 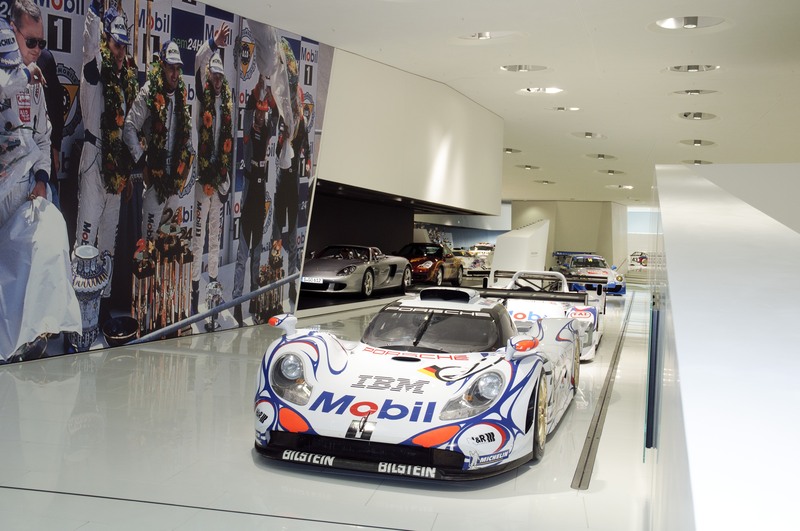 Also Porsche`s last winner car of Le Mans from 1998 will be displayed: the Porsche 911 GT1 `98. The cars on exhibit also include the 1979 Porsche 935, the Porsche 911 GT2 Le Mans, the 1994 Porsche 962 GT Dauer Le Mans as well as the WSC LMP1 of 1998. With the 962 GT Dauer Le Mans, Porsche competed in the 24-hour race under the direction of the Joest team in 1994. With this car, Mauro Baldi, Yannick Dalmas and Hurley Haywood took home the 13th overall win for Porsche. The model that Hans-Joachim Stuck, Danny Sullivan and Thierry Boutsen drove awaits the visitor here in the museum. This and other historical tales of the famous race will come alive in the special exhibition. Various historical and technological small exhibit pieces such as helmets, a brake disc from the Porsche 956 and the diary of Ferry Porsche from the collection of the Porsche corporate archive round off perfectly the historical journey through time of Porsche at Le Mans. On the weekend of the race, June 14th to 15th, visitors can follow the race live as part of a public viewing in the Porsche Museum (free entrance then). On the weekend of the race, the Porsche Museum will be open for the first time for more than 24 hours straight, from Saturday, June 14, starting at 9:00 a.m., until Sunday, June 15, 6:00 p.m. Visitors and fans of the endurance race can follow the race live as part of a public viewing programme on several monitors inside and around the museum building. Entrance is free of charge on this racing weekend. All 16 Porsche winners of Le Mans will be available as model cars in a scale of 1:43 in the shop of the Porsche Museum. The museum shop has a selection of specific items as part of the Le Mans special exhibition for sale to the public. Along with posters, postcards and polo shirts, all 16 overall winners of Le Mans will be available as model cars in a scale of 1:43. 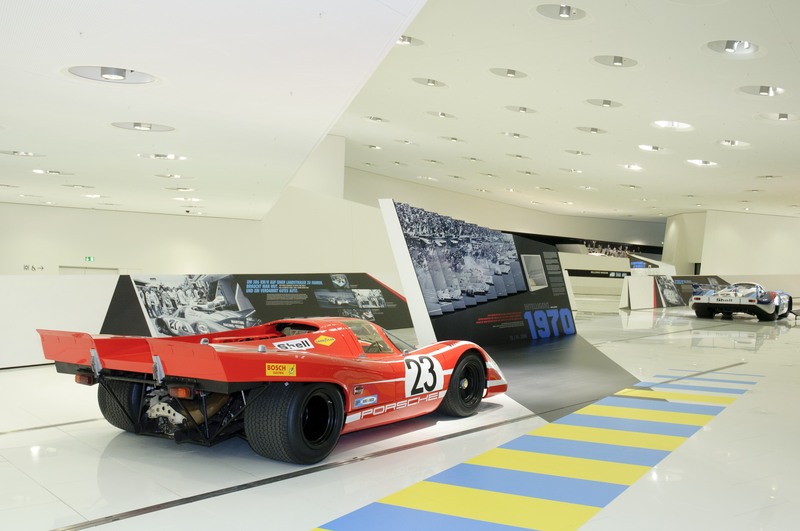 The Porsche Museum is open from 9:00 a.m. to 6:00 p.m. Tuesday to Sunday admission is eight euros for adults. Reduced price tickets cost four euros. You’ll find more information on the Internet at: http://www.porsche.com/museum.